Except where otherwise stated, all prices include course fee, morning coffee, lunch, afternoon tea, dinner, bed and continental breakfast. Chris Hewer explains clearly and concisely Islam's beginnings, development, beliefs and practices. An excellent clarification of a faith which is often distorted through misinformation and disinformation. For more information, please click here. Being Faithful to the Tradition : Believing in God's Word? An exploration of the ways in which Christians and Muslims understand and interpret scripture with Prof Tom Greggs and Dr Mohammad Seddon. For more information, please click here. A study day with Keith Ward. The question of what it is to be a human person is the biggest intellectual question of our day. Are we nothing but matter or is there another, deeply valuable part of us which transcends our bodies in nature and moral worth: the soul. This age old debate has taken the recent limelight through the works of the New Atheists. For more information, please click here. The 13th annual weekend of screenings, discussions, clips and cuttings. As usual, the participants will explore the relationship between film and theology. Offers of papers are welcome. Films include: Four Lions, The Infidel, Metropolis, Agora, Whisky Galore! For more information, please click here. John Shelby Spong's last week of teaching at Gladstone's Library will reveal his liberating understanding of John's Gospel. Jack Spong is the leading spokesperson for an open, scholarly and progressive Christianity. For more information, please click here. A weekend in conversation with John Shelby Spong. This seminar is for a limited number of invited attendees. For an invitation to this special event, please contact the Library. It is an opportunity to re-visit the writings and thoughts of Jack Spong on his last lecture tour of the UK. For more informatio, please click here. Acclaimed American novelist, theologian and cultural critic, Greg Garrett, leads this creative writing workshop following a month's residency at the Library. For more information, please click here. By popular demand, Kalyan Dey offers a distinctive, insightful and liberal reading of John's Gospel that will help you look at the gospel with fresh eyes. As the National Memorial to Gladstone, the Library provides the perfect setting for the annual Gladstone colloquium for scholars and Gladstone enthusiasts. 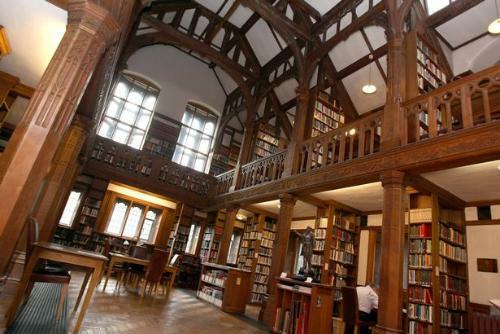 The weekend includes a trip to Gladstone's study, the Temple of Peace, at Hawarden Castle. Offers of papers on all aspects of Gladstone's life and times are welcome. If you would like to offer a paper, please contact the conference organiser, Dr David Brooks, Department of History, Queen Mary, University of London, Mile End Road, London E1 4NS or email [email protected] by March 31st. Please contact the Library to book your accommodation. Kalyan Dey explores a selection of texts for those who are seeking an opportunity to learn, revise or extend their knowledge of New Testament Greek. No prior knowledge is assumed or required. This course offers an exciting way to enjoy and understand Biblical Hebrew. Lyn Bechtel leads the week for those who wish to begin to read Biblical Hebrew. It can be enjoyed by those who know a little Hebrew and wish to revise and improve their knowledge or those who have no prior knowledge. This exciting new course aims to take complete beginners to the point where they can read some short extracts of poetry and prose by Latin authors. Robert Parker leads the week for those who wish to begin to read Latin. It can also be enjoyed by those who know a little Latin and wish to revise and improve their knowledge of it but no prior knowledge is assumed. For more information, please click here. Come with little or no knowledge of the Welsh language - just a desire to learn - and by the end of the week, Julie Brake will have helped you achieve a basic ability in Welsh. Gregory Cameron, Simon Sarmiento and others explore the current state of Anglicanism and suggest future options and possibilities. Following the success of Understanding Islam, Chris Hewer takes us deeper into the faith, culture and practice of Islam and its influence today. For more information, please click here. David Keller and Emily Wilmer return to lead another week of spiritual insights from the Desert and Celtic saints and to reflect on their application for today's mission and ministry. For more information, please click here. Tom Aitken and Peter Francis continue to revive, review and enthuse about classic and recent films of faith and doubt. Seven films will be introduced, watched and discussed including Oedipus Wrecks, War Requiem and Lourdes. The perfect opportunity to pour a large Scotch and sit by the open fire pondering the life and works of John Buchan. For more information, please click here. Focusing upon Christ's healing ministry, Susan Woodhead explores the needs of both patient and healer. She draws upon many years of experience as a practitioner in complementary medicine and in counselling and as a practising Christian. Michael Wheeler discusses Christ's healing ministry from both theological and cultural viewpoints. An invitation to urban theologians and practitioners to come together and reflect on their urban experience as they attempt to forge a distinctive urban theology.